CHARLOTTESVILLE, Va. — A KKK rally in Virginia was met with a swelling protest on Saturday. An estimated 50 Klan members gathered in Charlottesville to express objection to the city council’s decision to remove a statue of Confederate Gen. Robert E. Lee from Lee Park, which has now been renamed Emancipation Park. The statue has stood since 1924, but has recently become the subject of debate as some consider the display to be racist and “an emblem of white supremacy.” An injunction has currently stalled the removal until a court hearing in November. KKK Imperial Wizard David Duke also urged his Twitter followers to attend the rally. However, an estimated 1,000 people also turned out on Saturday to stand against the Klan. But members of the public also held signs such as “Racism destroys lives,” “Jesus said love your neighbor” and “Love trumps hate,” as they lined the streets surrounding the rally. Many counter-protesters were members or supporters of Black Lives Matter as they held signs or wore t-shirts bearing the movement’s name, and chanted the slogan in unison. Police were on hand on control the chaos and placed barricades around the statue as a precaution. Some officers were dressed in riot gear as they created a human blockade in the street. 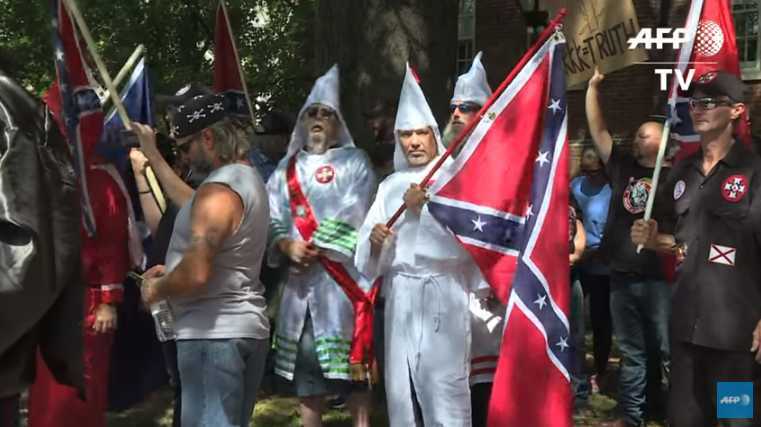 However, when members of the KKK sought to leave the event, some counter-protesters allegedly blocked their vehicles and refused to move when asked by police. Officers soon sought to disperse the gathering, and the environment became even more tense as “there were a number of incidents, including the use of pepper spray by the crowd,” according to Charlottesville spokesperson Miriam Dickler. Tear gas was then utilized to force the crowd to leave the area. In all, 23 people were arrested. Charlottesville’s mayor, Michael Singer, had urged the community to ignore the KKK. Church leaders had also hoped residents would spend the day elsewhere. “The most successful defiance will be to refuse to take their bait and continue to tell our story. Then their memory of Charlottesville will be of a community that repudiated them by not getting drawn into their pathetic drama,” Singer said.